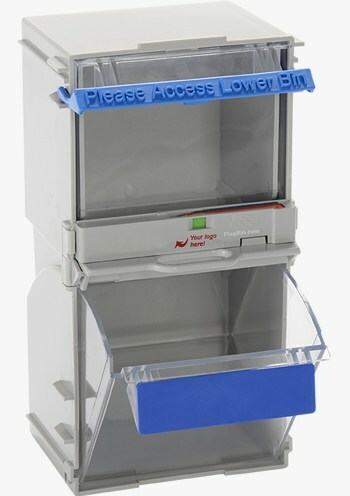 Hurst Green Plastics Ltd supplied its TwinBin® system to Airbus at Broughton, in North Wales, for the A380 wing production. The cost of supply was £10,000 which resulted in savings of £60,000 after only 5 months. Over £60,000 has so far been saved on the A380 production, as a result of a new system for storing and distributing fasteners which cuts down on waste and saves production hours. The new method of supply Aircraft General Supplies (AGS – term used for rivets and bolts) on A380 stage 00 was introduced by a cross functional team set up to look at ways of improving the process on the four Low Voltage Electromagnetic Riveting machines (LVER). Previously, production team members had to use a non-configured storage system or visit the logistics stores to get a bag of production bolts or rivets. Once they’d taken out the required number, bags of bolts were frequently left out on the side of the area, as there was nowhere to store them. This not only resulted in a considerable amount of waste, but also provided a potentially untidy and unsafe work area. To improve the process, the project team worked together with members of the production teams to examine the usage of bolts and analyse Statistical Process Control Data from the LVER machines. They gathered information as to exactly which types of bolts were needed, where and when. Lean tools such as 5C, KanBan, “Plan Do Check Act” (PDCA) and problem solving were used in order to ensure that a methodical, structured approach was used and that improvements were sustainable. Racking systems, which contain all the bolts, required for a particular operation, are now in place, right where they are needed, close by the working areas. The new system has brought tremendous benefits to the business, saving thousands of pounds in wasted AGS and making jobs overall more efficient. So far alone, around £45,000 worth of AGS and slaving has been returned to the business and a total of £14,500 in AGS scrap has been identified, and removed from the work areas. In addition, a considerable amount of production hours have been saved, as production team members no longer have to visit the stores for their AGS, and shortage calls to logistics have reduced by more than 75%. 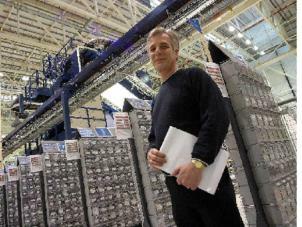 Ray Harper is pictured in front of the new racking system, which is saving Airbus tens of thousands of pounds.